Toronto—January 13, 2017—What’s in a name…of a school? Students at Ontario’s Catholic schools answered that question in 2-minute videos as part of a contest sponsored by the Ontario Catholic School Trustees’ Association (OCSTA). The winning videos were announced today. “A lot of thought goes into naming Catholic schools and for good reason as names have a role to play in inspiring students and the community as a whole. 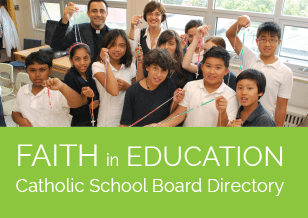 The saints and leaders, for whom many of our publicly-funded Catholic schools are named, lived faith-filled and courageous lives which is ideal material for students entering our contest. It is very important that our students have a good understanding and appreciation for the Charism of the person/symbol their school is named to honour. We were very impressed by the depth of research and creativity demonstrated by the elementary and secondary school students participating this year,” said Patrick Daly, OCSTA President. Ontario’s Catholic school students in grades 4-12 were invited to create 2-minute videos that tell the story of the person or saint for whom their school was named. OCSTA received over 170 submissions.